What is happening: Jesus was interrogated last night before the ruling body of Elders, the Sanhedrin, where they tried to figure out what to do with him. Finally he was locked away in a dungeon at the home of the High Priest. Picking up the story in Matthew Chapter 27, it is early morning and the chief priests and elders have finally decided to put Jesus to death. There is a problem, however. They don’t have the authority for that so they send Jesus to the Roman governor, P0ntius Pilate. When Judas realizes the consequences of his betrayal, he is filled with remorse. He makes his way back to the chief priests and offers to return the money if they will let Jesus go. They basically tell him he is wasting their time, so Judas goes out and commits suicide by hanging. Pilate doesn’t know what to make of Jesus because He won’t say anything. Pilate does not want to execute Jesus so he reminds the crowd of the custom which allows him to release a prisoner during Passover. Instead of asking for Jesus as he hoped, they ask for Barabbas, a man indicted for insurrection and slated for crucifixion. So Pilate makes a symbolic show of washing his hands to show he is not guilty of Jesus’ death. He has Jesus whipped and turned over for crucifixion. “Crucifixion is a method of deliberately slow and painful execution in which the condemned person is tied or nailed to a large wooden cross and left to hang until dead. It is principally known from antiquity, but remains in occasional use in some countries. This appearance before Pilate is sometime mid-morning and then he is paraded through the streets of Jerusalem out to Golgotha where by lunchtime, he is nailed to a cross. He hangs in agony for three hours. It is a slow, excruciatingly painful death. Finally his weakened body slumps lifeless. Shortly afterward, he is removed from the cross and hastily buried before sundown so the Sabbath prohibitions against work will not be broken. Thoughts to Ponder: Much has been written about the details of Jesus death and its significance. Suffice it to say that his own words sum it perfectly: “Greater love has no one than that he lay down his life for his friends.” Christians have tended to stay quiet and contemplative on this somber day. 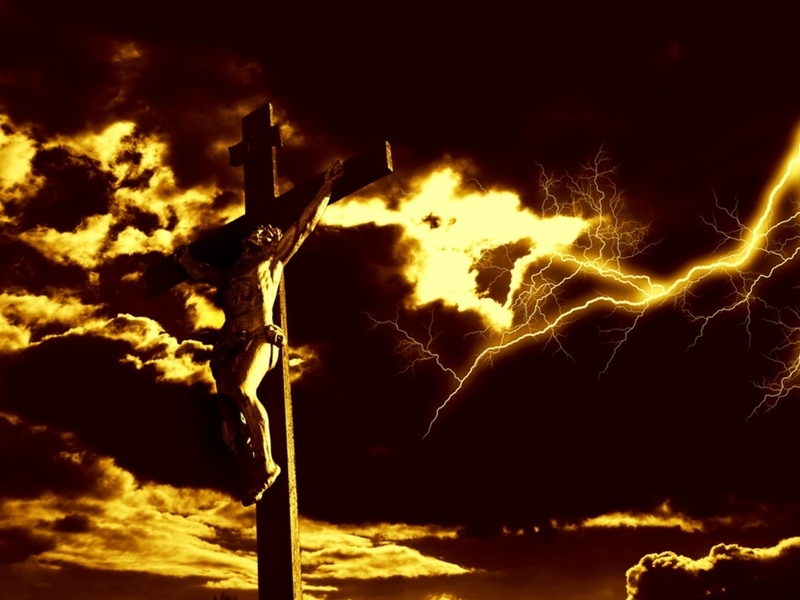 What thoughts come to you as you think about Good Friday? Prayer: We cannot even imagine such devotion that would drive a man to voluntarily relinquish his health and well-being in such an unjust and pain-filled way. Yet O Lord Jesus, you did this as an offering for the sins of all humanity. Help us to believe and receive this gift now and through all the days of our lives. AMEN. This entry was posted in Accomplishment, Adversity, Atonement, Bible, Courage, Crucifixion, Darkness, Evil, Faithfulness, Good Friday, Holy Week, Jesus, Manliness, Mission, New Covenant, Passion, Perseverance, Priorities, Prophecy, Rejection, Sacrificial Lamb, Salvation, Suffering and tagged Atonement, Christ, Crucifixion, Faithfulness, Forgiveness, Good Friday, Integrity, Jesus Christ, Suffering, Surrender. Bookmark the permalink.